T Dion Dawkins vs Edge Joey Bosa – Dawkins had a solid week in pass protection a week ago. The rookie has a perfect pass-blocking efficiency (PBE) of 100.0 against the Saints, not allowing a single pressure on 33 pass-blocking snaps. Overall this season Dawkins has graded as average, with an overall PFF grade of 70.6 and a pass-block grade of 70.9. Dawkins will be in for a much bigger challenge in Bosa, who is one of the elite edge defenders in the NFL. Bosa ranks second among edge defenders with a pass-rush grade of 93.1, his 47 total pressures are third-most and he is 12th with a pass-rush productivity rating (PRP) of 12.7. T Jordan Mills vs Edge Melvin Ingram – A player who may be in for an even bigger challenge than Dawkins is Mills. Mills have done quite well this season in pass protection, his pass-blocking grade of 77.6 ranks 23rd among 78 qualifying tackles this season. He is inside the top 20 in terms of PBE with a PBE of 96.3, allowing 15 total pressure on 318 pass blocking snaps. Ingram is having his best year to date, his overall grade of 92.8 is the highest by an edge defender this season and he also has the highest pass-rush grade of 94.0. Another pass-rushing category Ingram leads the league in is total pressures (51). QB Nathan Peterman vs CB Casey Hayward – With the announcement that Tyrod Taylor will be benched for the Chargers game, the Bills will look to rookie quarterback Nathan Peterman to the lead the offense. Peterman, the Bills fifth-round draft pick in 2017, had a passer rating of 123.0 on deep passes (20-plus yards in the air) last season at Pittsburgh, which ranked fifth among all FBS quarterbacks. Peterman also had a passer rating of 103.4 under pressure last season, which ranked sixth among FBS quarterbacks, including an 8-to-1 touchdown-to-interception ratio. Peterman will have a tough first game throwing against one of the best secondary’s in the NFL, particularly when he throws against Hayward, who is PFF’s sixth-highest graded corner with an overall PFF grade of 89.3. He is only allowing 51.3 percent of targets thrown at him to be caught. T Russell Okung vs. Edge Jerry Hughes – Okung’s overall grade of 73.6 is just average, but he does do well on passing downs. His pass-blocking efficiency rating of 96.0 is ranked 15th out of 58 offensive tackles. On 332 pass-block snaps, Okung has allowed just 17 total pressures (two sacks, two hits, 13 hurries). 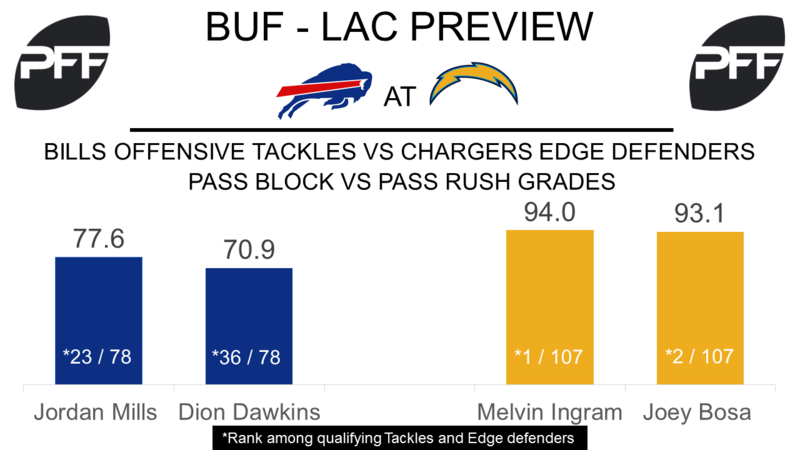 When the Chargers need a play through the air, he will have to fend off Bills edge defender Jerry Hughes, who has had all but one of his 243 pass-rush snaps come from the defense’s right side. With 30 total pressures (three sacks, seven hits, 20 hurries), Hughes has a pass-rush productivity rating of 9.6, ranked 23rd out of 64 qualified 4-3 defensive ends. Look for Hughes to go right at Okung, as he has generated eight of his 30 pressures with the bull rush technique. QB Philip Rivers vs. CB Tre’Davious White – Rivers is currently having the worst-graded year of his career (75.1) but still has shown fight as he always does. With that said, he probably won’t shy away from throwing at Tre’davious White, whose 88.1 overall grade is the ninth-best among all cornerbacks. Rivers has an adjusted completion percentage of 73.8, which is ranked 14th. However, when Rivers throws 20-plus yards downfield, he has an adjusted completion percentage of just 26.5, which is 33rd out of 35 qualifying quarterbacks. White will be a tough test for Rivers, as he has an 87.9 coverage grade and is allowing 1.22 yards per cover snap. Although Rivers hasn’t had much success throwing deep this year, one weakness that he may be able to exploit against White is the go route; on 17 go route attempts vs. White, he has allowed seven catches for 212 yards, two touchdowns, and a passer rating of 127.6. WR Keenan Allen vs. CB Leonard Johnson – Allen has slowly transformed to primarily a slot receiver over the years. When he was a rookie in 2013, he ran just 12 percent of his routes from the slot. In his last healthy year in 2015, he ran 18 percent of his routes from the slot. 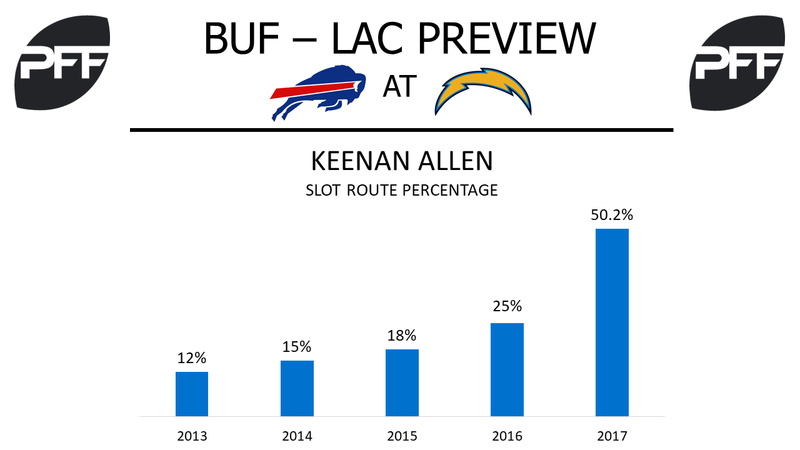 Fast forward to 2017, and Allen has ran 50.2 perccent of his routes from the slot, where he has gained an average of 1.72 yards per route, 21st out of 62 receivers with at least 60 slot routes. Buffalo’s nickelback Leonard Johnson, who has 180 more slot coverage routes than any other Bills’ cornerback, will have try to keep Allen in check. Johnson is allowing an average of 1.16 yards per cover snap in the slot, which ranks 31st out of 56 cornerbacks with at least 60 slot coverage snaps.